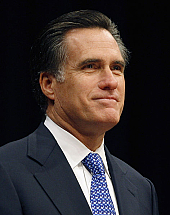 Hello, I’m Mitt Romney, and besides having perfect hair I’m running for President of the United States. I want to take a few moments in my opening statement of this first (and hopefully only) Republican primary debate to eliminate one of my competitors, Sarah Palin. Frankly, I’m shocked that I’m standing up here next to my old new friends Tim Pawlenty, Mike Huckabee, Jeb Bush, that old white guy over there that I don’t recognize but really kind of fits in with the rest of us. Not shocked that I’m here or that they are here, but that Sarah Palin is also here. I mean seriously. Uh, hmm. I mean, I welcome all my valiant competitors, including the esteemed former Governor of Alaska who served the party so well as our Republican vice-presidential nominee in 2008….ahem, er, hack, er… Sorry, something in my throat. Well, actually, I’ve been through this before and I’m not letting anyone get in my way this time, most certainly not a half-term Governor. So I’ll make this quick. Former Governor Palin quit her job. In fact, a bunch of them. A quick recap. So, after quitting 4 colleges before finally (apparently) getting a journalism degree in the 5th one, then doing some sports radio and TV, my esteemed Republican colleague got elected to a series of positions. 2) Mayor of Wasilla: Still less people than even one of the little islands I own. And yet she hired some guy to administrate the city so she could focus on practicing her 3rd place runner-up Alaska pageant skills on the populace. But I do give her credit for bringing in those big box stores, you know, the ones that put local merchants out of business and buy all their stuff from China. And she definitely should take credit for hiring those big city consultants to lobby for millions of dollars. No wonder she got all of 909 votes to win a second term. 3) Alaska Oil and Gas Conservation Commission: Given that Alaska has a long history of political corruption, Sarah won a prize gem with her appointment to the Commission that gets to decide how all that oil money gets spent. Okay, so she didn’t know anything about oil when she was handed the chairmanship (by the corrupt Governor she was later to charge with corruption), but it gave her a prime spot to get people fired before she suddenly resigned. So seriously, my indomitable fellow Republican/Tea Party/Alaska Independence Party colleague clearly would be like rolling the dice in Vegas on a tilted craps table in the dark should you choose to unbelievably give her the nomination. All I can say is, make sure John McCain does not pick her running mate if you go down that road. But since I want to get all those energized Tea Party people to vote for me, you know, all the goods ones and even those who are biased against Mormons or any other religion or sexual preference but their own, I want to end my opening remarks by falling over backwards saying all sorts of nice things about Sarah Palin so that the tea partiers will forget everything I’ve said up to this point. Thank you Mr. Beck for allowing me to run over my time in my opening remarks. And thank you for moderating this first (and only) Republican primary debate. God bless you, and God bless America!